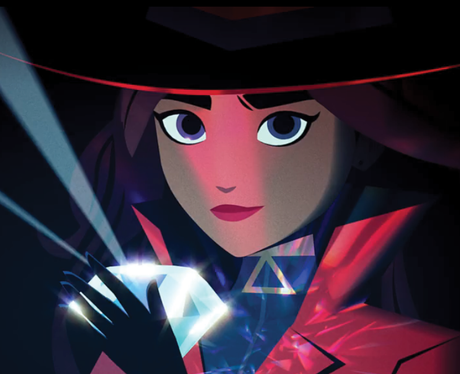 Gina Rodriguez and Finn Wolfhard star in 'Carmen Sandiego', the animated series about the prolific thief who turns her skills on her thieving peers. Meet the rest of the voice cast which includes the legendary Rita Moreno and other veteran voice talents. Netflix's 'Carmen Sandiego' tells the story of a girl raised on a secluded island where thieves are trained. "Black Sheep", as she is initially called, eventually turns her pickpocketing skills on her fellow thieves including rival Sheena and former friend Gray. Gina Rodriguez and Finn Wolfhard star as Carmen and Player in this Netflix animated series. Gina Rodriguez voices the titular character of Carmen Sandiego. Carmen is a thief who switches sides to steal from fellow pickpockets and thieves. You'll know Gina Rodriguez from CW's 'Jane The Virgin' and its upcoming spin-off 'Jane The Novelas'. Finn Woflhard voices Player in Netflix's 'Carmen Sandiego'. Player is always on hand for technical support. You know Finn best for his role as Mike Wheeler on 'Stranger Things'. Rafael Peteradi plays Carmen Santiego's interpol foe, Chase Devineaux. You may know him best from roles 'K.C. Undercover' and '2 Broke Girls'. Charlet Chung plays the pragmatic Julia Argent. You may know Charlet Chung from '90210', 'Shake It Up', and 'Grace and Frankie'. Michael Goldsmith plays the confident Gray, Carmen's old friend from V.I.L.E. You likely recognise Michael Goldmith from small roles in 'Doctor Who' and 'Gotham'. Mary Elizabeth McGlynn plays Coach Brunt. Carmen suspects that Coach Brunt is the one who found her as a baby. Mary Elizabeth McGlynn has been in many other shows. Fans might recoginise her voice from 'Cowboy Bebop', 'Naruto', and 'Tangled: The Series'. Paul Nakacauchi plays Shadowsan. Shadowsan doesn't go easy on Carmen and is partially responsible for her leaving V.I.L.E. You may know Paul Nakachuchi from Netflix's 'Death Note' and 'The Legend of Kora'. Kari Woodgren plays Carmen's adversary Sheena, aka Tigress. You may recognise Kari's voice from 'Votron', 'The Boss Baby: Back In Business' and 'Kung Fu: Legend of Awesomeness'. Rita Moreno voices V.I.L.E. 's accountant Cookie Booker. Cookie is in charge of V.I.L.E's accounts. Netflix fans will know Rita Moreno from Netflix's 'One Day At A Time' and countless other projects. Rita Moreno has been a film and TV star since the 1950s. Toks Olagundoye plays Countess Cleo. Toks has also appeared in 'Castle', 'Steven Universe', and 'Ducktales'. Sharon Muthu plays multiple characters in 'Carmen Sandiego'. Sharon plays Dr. Bellum, Dr.Jeanine Dennam, and Agent Zari. Muthu has had roles in 'Modern Family', 'Black-ish', and 'Grey's Anatomy'.